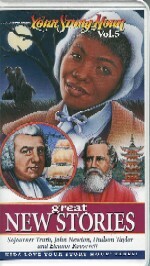 a slave-trader who became author of "Amazing Grace"
Great listening for "kids of all ages!" Three Remarkable Lives. One Amazing Grace. Experience events in the late 1700’s that led three men – John Newton, Olaudah Equiano and William Wilberforce – to join together in a fight against England’s slave trade.